When it comes to origin stories of businesses, the most compelling tales are often those that describe an organization emerging organically, by rooting its strategic model in the inherent strengths and interests of its founder. Such is the case with Westbrook, Connecticut-based Gowrie Group—a leading independent insurance agency that boasts more than four decades of experience providing sophisticated insurance solutions to more than 14,000 clients and business owners nationwide. Gowrie’s team of 175-plus employees is situated in offices across Connecticut, Massachusetts, Maryland and Rhode Island. The agency offers customized coverage and risk management plans for personal and family assets such as homes, cars and car collections, horses, boats and fine art. Gowrie’s commercial solutions currently serve some 2,500 businesses across a range of sectors spanning marine, healthcare, technology, retail, manufacturing and non-profit interests. But what truly differentiates Gowrie is their ability to find areas where their clients and team are authentically engaged, and offer insurance solutions grounded not only in deep expertise and advice, but also in genuine investment. Which brings us back to the company’s 1974 launch. It was Chairman and CEO Carter Gowrie’s robust enthusiasm for all things nautical that inspired Gowrie Group’s creation. As a lifelong boater and an internationally accomplished sailboat racer, it was only natural for Carter to develop a business centering on his true passion—the water. “I grew up sailing, so starting a business selling boat and yacht insurance was a natural fit,” Carter explains. But what started out as a boutique agency covering all things marine: boats, yachts, cruisers, sailboats, trawlers, and other watercraft, soon blossomed into other areas. After all: many boat owners also own coastal homes or other high-value properties, and engage in a wide range of other passions such as horses and collections. In fact, property insurance grew into such a successful business line for Gowrie that new clients frequently come to the table without initially considering marine coverage, until a Gowrie agent describes how he or she can help holistically round out their coverage portfolios. Today, the agency offers a broad range of marine, personal, and commercial insurance solutions, as well as employee benefits and life and health solutions. In addition to augmenting its coverage options, over the years Gowrie has also expanded its geographical reach. While the agency has 5 offices across the eastern seaboard, producers are also licensed across all 50 states. This allows them to serve clients across the country, and also fastidiously maintain relationships with existing clients even when they leave the East Coast for other regions—strengthening the agent-client connection and ultimately increasing trust. Like many longstanding businesses, Gowrie relies on word-of-mouth references from existing customers, attorneys, accountants, and other centers of influence to help build their book of business. But the firm has also found growth aligning with cultural institutions and not-for-profits whose missions they are enthusiastic about. They have, for instance, cultivated branding partnerships with US Sailing, the governing body for the sport of sailing, The Mystic Seaport Museum, the country’s leading maritime museum, and The Rhode Island Marine Trades Association (RIMTA), which advocates and promotes the recreational boating industry. Gowrie also supports The Kate, a historic theater and performing arts center in shoreline Connecticut. And Gowrie’s team members can often be found at sailing races and equine events—not just as spectators, but also as competitors at events such as the Devon Horse Show. And while “passion” and “insurance” are two words that aren’t often seen together, Gowrie has found that their engagement with clients often happens in areas where they are truly invested. 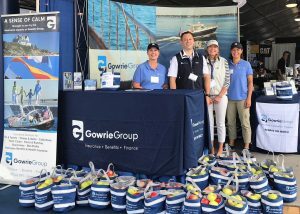 Gowrie Group at the Newport Boat Show. When it comes to serving personal insurance clients, it’s the experience and understanding Gowrie brings that offer the most value. John Fisher, President and Principal of Personal Insurance, explains that in his 30+ years of working with successful families, the most important part of the equation is establishing trust. “We speak to the clients on a level that is as close to peer to peer as it can be. When that happens, you have a good relationship, with a good healthy exchange of information as well as advice,” John explains. While Gowrie is committed to supporting their clients, they are no less resolute in fostering a healthy work environment within their own walls. In addition to building G-Fit, an on-site gym to encourage lunchtime workouts, Gowrie engaged a trainer and wellness coach to help employees combat stress and increase productivity, and offers free fitness classes during the work week. It’s this type of commitment to employees that attracted Dennis to Gowrie nearly 15 years ago. 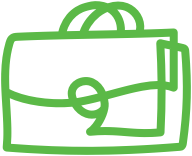 Gowrie has historically sought out similar cultural sensibilities, in cultivating partnerships with more than 50 A-rated affiliate carriers. Working with organizations they hold in high regard is essential—and that regard extends beyond the business philosophy into relationships with the team. It’s a philosophy that holds equally true in Gowrie’s recent decision to partner with Berkley One, a Berkley Company. It’s a partnership established with the characteristic enthusiasm and investment that have been hallmarks of Gowrie’s success for the last forty-four years. Gowrie Group offers Business Insurance, Personal Insurance, Marine Insurance, Employee Benefits, and Life/Health Insurance. The agency is based in Westbrook, CT, and has offices in Newport, RI, Darien, CT, Annapolis, MD, and Marshfield, MA.